Dengue fever or break-bone fever is an infection borne by mosquito that causes an acute flu-like illness. 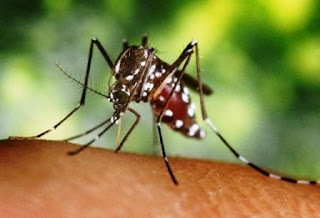 There exist four different types of viruses that can cause dengue fever and all these are spread by a particular species of mosquito known as the Aedes aegypti mosquito and more seldom by the Aedes albopictus mosquito. Aedes aegypti started off in Africa, but nowadays is found in all the tropical regions of the world and thrives in and near to areas of human population. Nearly 100 million cases of dengue fever are reported throughout the world every year. The most widespread occurrences are reported in urban parts of subtropical and tropical areas, such as Central and South America, parts of Africa, parts of Asia, the Caribbean and the Pacific. Dengue is presently as widespread in urban areas of its range as in rural areas. As stated by the World Health Organization (WHO), nearly 2.5 billion people, or two-fifths of the world's population, are at the risk of catching dengue. The disease is currently widespread in more than 100 countries. Dengue fever can vary from mild to acute. The acute forms of dengue fever include dengue shock syndrome and dengue hemorrhagic fever (DHF). Patients who suffer from acute forms generally need to be admitted to hospital. Dengue hemorrhagic fever is a foremost reason of acute illness and death among children in some Asian countries. Dengue infection rates among people who have not been formerly infected by the virus are usually 40% to 50% during epidemics however it may sometimes get to 80% to 90%. Roughly half a million people with DHF are hospitalized each year, out of which several are children. DHF fatality rate is 2.5 percent and may go above 20% if not treated properly in time. If proper medical care with health care professionals trained in treating DHF is accessible then the fatality rate may reduce to even less than 1%. Even though there is no definite cure for Dengue, it can still be taken care of provided that it is caught ahead of developing into dengue shock syndrome or dengue hemorrhagic fever. The severity of symptoms of dengue fever can vary from mild to severe. Mild Dengue fever symptoms can be evident up to seven days after a person is bitten by mosquito carrying the virus and frequently vanish after a week. This type barely ever results in grave or incurable complications. The symptoms of mild dengue fever are muscles and joints ache, body rash that disappear and reappear, high fever, extreme headache, pain behind the eyes, vomiting and nausea. Dengue hemorrhagic fever (DHF) symptoms during beginning may be mild however they progressively get worse after a few days. DHF can lead to death if untreated on time. Mild dengue fever symptoms may crop up in DHF, in addition to symptoms such as mouth/gums bleeding, nosebleeds, clammy skin, significantly damaged lymph and blood vessels, internal bleeding resulting in black vomit and feces (stools), lower platelet count in blood (platelets are the cells that help clot the blood), sensitive stomach, small blood blot beneath skin and weak pulse. Dengue shock syndrome is the most terrible form of dengue which can also lead to death. Yet again mild symptoms may be evident. Others that are likely to appear are severe stomach pain, disorientation, abrupt hypotension or rapid fall in blood pressure, heavy bleeding, regular vomiting, blood vessels leaking fluid and death. The major segment of people suffering from dengue fever, recover within two weeks. Though, some patients can experience fatigue and depression for months following the infection. Dengue fever can build up to harsher forms of the disease such as Dengue hemorrhagic fever and Dengue shock syndrome. In order to properly diagnose dengue fever the doctors will assess the symptoms. Some tests may be ordered to verify whether it is a dengue infection or some other illness since the symptoms of dengue fever are very similar to that of malaria. Blood sample Test - If the dengue virus is detected in the blood test then diagnosis is clear-cut. However, if it is not then there are other blood tests which can identify antibodies, antigens and nucleic acids, comprising of ELISA (enzyme-linked immunosorbent assay), HI assay (hemagglutination inhibition assay) and RT-PCR (reverse transcriptase-polymerase chain reaction). Assessing patient’s medical history - The doctor will assess patient’s travel history and medical history, mainly if it has to do with mosquito exposure. Since dengue is caused by a virus, thus there is no particular treatment or cure. However, there are things that can be done to help the patient, depending on the severity of the disease. For mild nature dengue, the treatment methods are prevention of dehydration and using painkillers. Since high fever and vomiting can dehydrate the body, it is necessary to rehydrate the body by drinking clean water with rehydration salts that can aid in restoring fluids and minerals. Painkillers help in lowering fever and lessening pain. For the more severe forms of dengue fever, the treatment include intravenous fluid supplementation (IV drip), blood transfusion and hospital care. In harsher cases of dengue where patient is unable to take fluids via the mouth, in such cases patients receive an IV drip. Patients with intense dehydration, blood transfusion or platelet transfusions may be recommended for them. Patients suffering from intense forms of dengue fever must be treated by medical professionals, so that they can be properly monitored. If the patient is treated under the vigilance of proper and trained hospital care then the effects and complications of hemorrhagic fever can be greatly reduced and lives can be saved. In complications Corticosteroids and or medications such as prednisone and immunoglobulin are used to increase the blood platelet. Fostering a strong and healthy immune system is the best protection against the malicious viral diseases, just as it is against any other infectious disease. Some common ways to build up a robust and strong immune system are eating well balanced wholesome diet, avoiding sugar and fructose, getting plenty of vitamin D, eating garlic regularly, taking plenty vitamin C, exercising regularly, getting enough sleep and deal with sources of stress or anxiety. Increasing the intake of food that are rich in omega-3 fatty acid such as walnuts, spinach and flax seeds helps the immune system thus helping the bone marrow to create more platelets. Since vitamin D is a powerful antiviral and a chief player in the body’s immune function, so it is essential to get enough vitamin D from sun exposure or a supplement. Vitamin C easily gets absorbed in the body and quickly restores the platelet count in dengue. Papaya leaf and Papaya fruit juices are high in complex vitamins and help increase the production of platelets. Aloe vera juice is very helpful in increasing the platelet count. Take 30 ml of aloe vera juice after every meal. Drink water in huge quantities in order to restore fluid loss. It will also help to lower down the body temperature. Shun the intake of solid foods till the time fever is there. Replace the foods by drinking plenty of distilled water and/or juices. Consume vitamin & antioxidant rich foods such as berries, tomatoes, oranges, kiwi and cabbage. Fresh juices prove to be very beneficial in overcoming weakness of body and to provide strength to body. Some of the recommended fruit juices by doctors are Pomegranate, orange, apple and sweet lemon juices. To augment the blood count pomegranate juice/ black grape juice is beneficial. The orange juice aids in digestion, boost the urinary output, promotes antibodies for quicker healing and revival. Tulsi (Basil Leaves): Add basil leaves to tea to give it herbal essence. Basil leaves have shown properties to slash down the temperature of body. Neem leaves, Neem Oil: These are a great disinfecting agent and should be applied 2 to 3 times a day in dosages of between 15 to 60 grams. Usage should be constrained in both males and females seeking pregnancy. Coriander Leaves: The leaves of the coriander can be taken in the form of a tonic to lower down the fever in dengue. Hogweed: It is also used to bring down the body temperature. Hogweed produces ample of perspiration which swills out the body toxins and brings down the fever. Root of Cassia Tree: It is again used as a tonic for reducing dengue fever. Fenugreek leaves: These are taken as herbal tea to reduce fevers. This drink functions as a comforting and decontamination agent for the human system. Bloodwort: It is a conventionally used cure for all types of fevers in Ayurvedic medicine. When bloodwort is used in the form of a hot blend, it brings out sweat expelling the toxins from the body and reducing the fever.